So, let’s walk through this. First, vRO needs to have vCenter added to it. This is done with the “Add a vCenter Server instance” workflow in vRO. 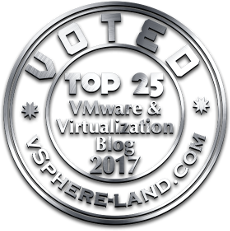 Run this and add your vCenter. Generally this part is pretty straight forward. Use the FQDN and give it administrative credentials. Once that finishes, now you need to actually register the vRO instance as an extension. This is also done in vRO, using the workflow called “Register vCenter Orchestrator as a vCenter extension”. There is only one screen. It asks for the vCenter. So choose your vCenter. Also it OPTIONALLY asks for an address. This address is what vCenter will use to download the plugin info from and it has to be in the form of https://<vro address>:8281. Or another port if you changed it for some reason. So. Do you need to enter this? Not always. vRO will default to using the IP of the vRO instance. You can confirm this by using the Managed Object Browser of your vCenter. Generally, I recommend doing this. 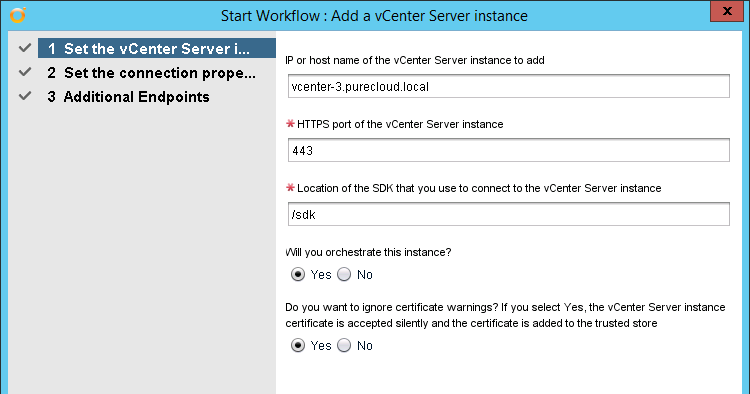 If the vCenter can not resolve or contact the default address this integration will not work. I ran into this in the situation where my vRO had a IPv6 and IPv4 address and vRO defaulted to the IPv6 address which my vCenter could not resolve. So I would just enter in something you know works to save yourself a headache. Once it has installed you have to reboot your vCenter! This is a step that is easy to miss, and is required so do this when convenient. Found that post just after publishing this one! Would have saved me some writing. 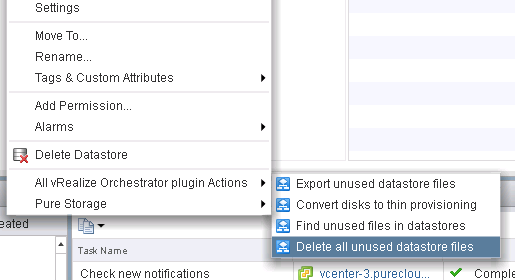 Once rebooted, log into your vCenter and from the home screen, click on the vRealize Orchestrator icon. You should see your vRO server listed. 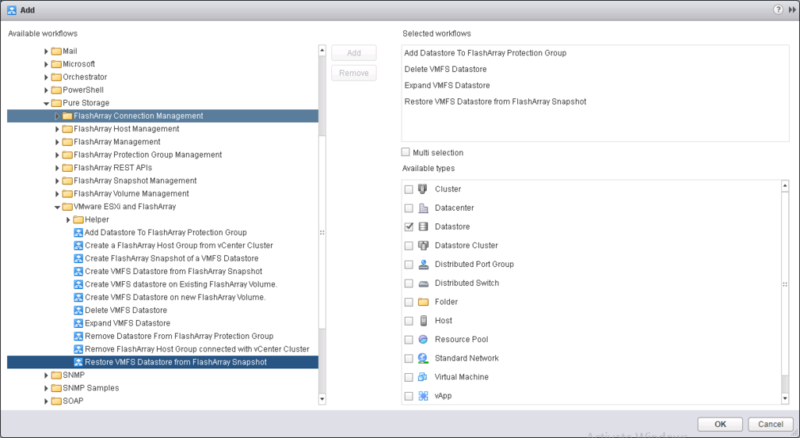 If not, look at the virgo (vSphere Client) logs of the vCenter to see why it doesn’t appear. Click on the vRO Home button and then the “Context Actions” tab in the pane that appears. 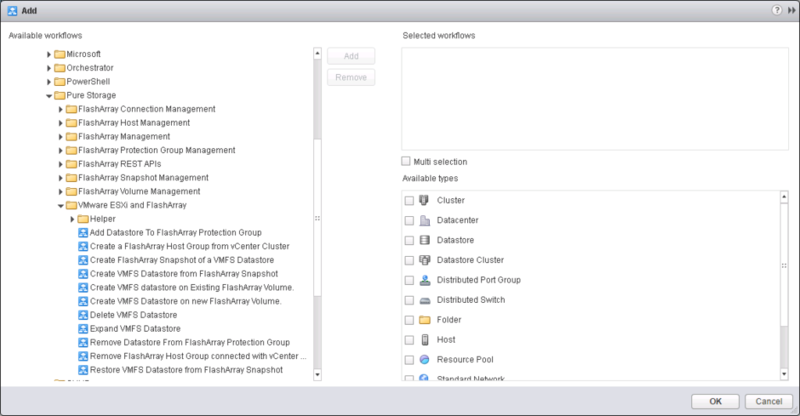 The VMware-centric FlashArray vRO default workflows are listed above (there will be a lot more added soon). Choose a workflow or workflows. 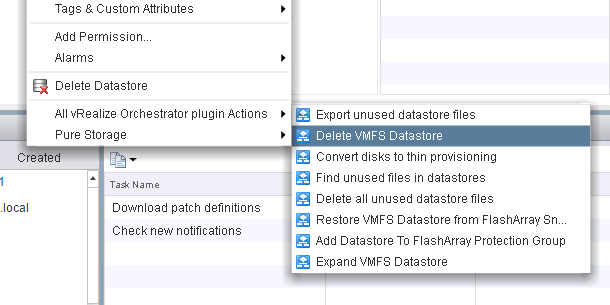 In this case, I will choose “Expand VMFS Datastore”, “Delete VMFS datastore”, ” Restore VMFS datastore from FlashArray Snapshot”, and “Add Datastore to FlashArray Protection Group”.. I will then choose the object I want them to be available from. Which in this case is a datastore object. Then click OK and log out and then back into the vSphere Client. A lot more on this topic to come. Including access control and more. Stay tuned.